An increased contact area with a raw aluminium finish and additional bite points are the hallmarks of DMM's revolutionary TripleGrip cam lobes. These features combine to increase friction between the cam lobe and the rock. The result is greater holding power and reduced walking, particularly in slick or soft rock types and sub-optimal placements. TripleGrip lobes are DMM’s patented cam technology designed to revolutionise friction power and supply unparalleled performance in sub-optimal placements like flared cracks or slick rock. DMM have managed to triple the resistance and grip strength of the Dragon cam: by machining a raw aluminium finish and dividing the cam’s bite points into three individual surfaces, the Dragon now has twelve areas of surface-contact rather than four, meaning it excels in slick or soft rock. In slippery situations, the Dragon cam is a friend that you can count on. 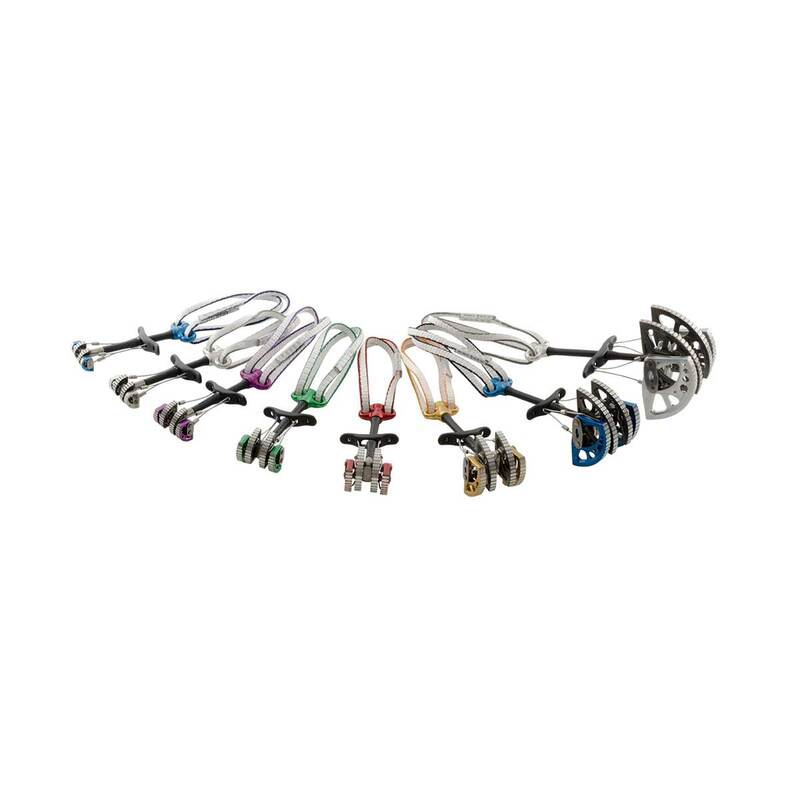 Dual axle cams are designed to do two things: help you get the right placement first time, and make your rack lighter. A greater range of motion means you need fewer units to cover a large range of crack sizes, meaning you save on carry weight, as well as making it easier to choose the right size cam for the job first time. All DMM cams use high quality stainless steel axles that offer increased levels of corrosion resistance and high strength levels, so carry less, save more, and climb faster. A thumb press has two main benefits: it’s a simpler configuration than a thumb loop meaning less to get in the way of a good placement when you’re pumped or fumbling with thick gloves in winter, and it allows you to have an extendable sling built in to the cam whilst still achieving a high strength rating. DMM have CNC’d extra grip into the thumb presses to give it the best handling characteristics possible. An extendable Dyneema greatly increases the speed and ease of extending placements, decreases rope drag, and saves weight on your rack. If you need to extend the sling, simply unloop it when the cam is placed, and you have it extended. 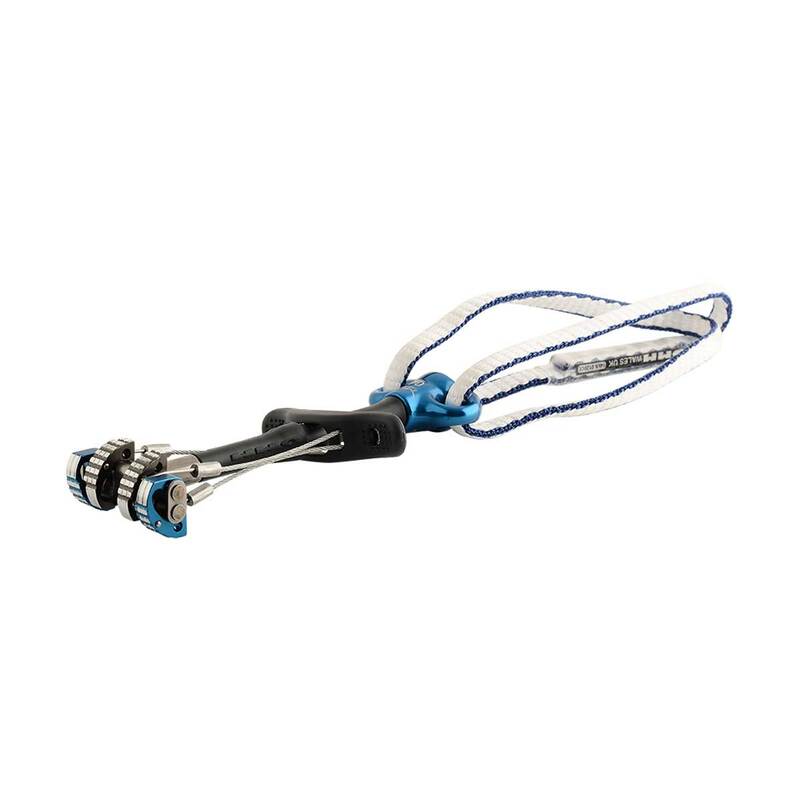 Not only does this decrease rope drag by allowing the rope to form a straighter line or smaller angles, it also means you need to carry less quickdraws. DMM’s compact stitching makes re-racking extended Dragons quick and easy, for a completely faster and lighter ascent. Cams with single stems are more forgiving in fall scenarios where the rock formation has prevented the cam from being placed in the direction of the load. Simply put, the Dragon’s firm but flexible stem allows for 360° flexibility, maximising your placement options, and allowing you to put cams where you normally wouldn’t trust them. This Dragon is really solid and the extendable dyneema it's a great plus. Just bought 2 pieces of dragon Dragon Cam II nr. 1. Holds a tank in solid rock, it' light and the extendable sling makes the rope easier to drag in corners. I definitively will buy more. Totally love these cams, they are great. Very robust, great in the rock, and being dragged up multi pitches. The extendable slings are brilliant, this feature for me is a great addition on top of an already superb cam. I would highly recommend these cams. I have the full set.....and I’ve also seen/heard DMM have brought out some bigger sizes. No doubt I’ll buy them too if epic.tv bet them in stock haha. Lost my DMM demon cam of the same size last summer and had been putting off the purchase of a new one for ages due to the price of the size 6 in most shops! Was really surpized how well priced it was on EPICtvs shop and I used the 10% discount!! wicked stuff! delivered in 3 days from when I ordered . The new dragons are mint!! The one thing iv always hated about new cams is the slippy new surface on the lobes , the new dragons have this removed and it makes a serious difference to how the bite! Im normally a totem guy but would happen to have these in the smaller sizes too! As i am climbing in Greece, i bought the Dragon cams because i wanted the best grip in limestone rock. I think it was a good choice because these cams gives a nice sense of safety, and realy make solid placements. The extendable sling also is a good option, but you still need a quickdraw. It should have been a bit longer! Another positive is that the sizes of the cams and the colors are completely compatible with the more widespread camalots.The only disadvantages is that compared with camalots they are heavier and the stem is harder and less flexible, but it does not seem to be a problem. I think also that they are a bit more expensive. Despite these disadvantages, i am very satisfied with my choice and i have done some grest and confident climbs with the dragon cams! I have already used the dragon cams before, and I loved them since the beginning. I love the extendable sling that basically allows to carry less quickdraws. The non-anodized finish of the cams' head provides the best friction I have seen so far. Love the fact that the color matches the BD standard-colors used for the camalots.